In violation of the Treaty of Versailles, Germany initiated an ambitious military rearmament program to restore its military strength; covert air reconnaissance missions commenced. Germany began to secure its national borders. On January 26, Germany and Poland signed a non-aggression agreement. 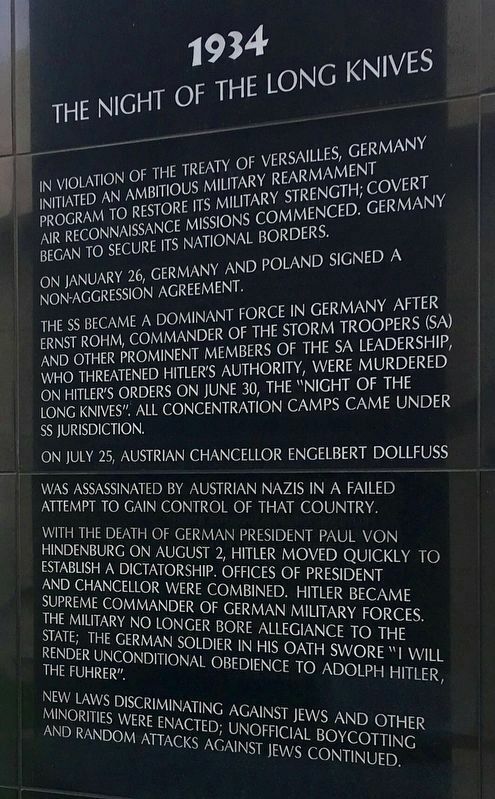 The SS became a dominant force in Germany after Ernst Rohm, commander of the Storm Troopers (SA) and other prominent members of the SA leadership who threatened Hitler’s authority, were murdered on Hitler’s orders on June 30, the "Night of the Long Knives”. All concentration camps came under SS jurisdiction. On July 25, Austrian chancellor Engelbert Dollfuss was assassinated by Austrian Nazis in a failed attempt to gain control of that country. to Adolph Hitler, the Fuhrer". New laws discriminating against Jews and other minorities were enacted; unofficial boycotting and random attacks against Jews continued. Erected 1992 by Los Angeles Museum of The Holocaust; American Congress of Jews from Poland; and Survivors of Concentration Camps. Location. 34° 4.485′ N, 118° 21.339′ W. Marker is in Los Angeles, California, in Los Angeles County. Marker can be reached from The Grove Drive 0.3 miles north of 3rd Street, on the right when traveling north. Touch for map. 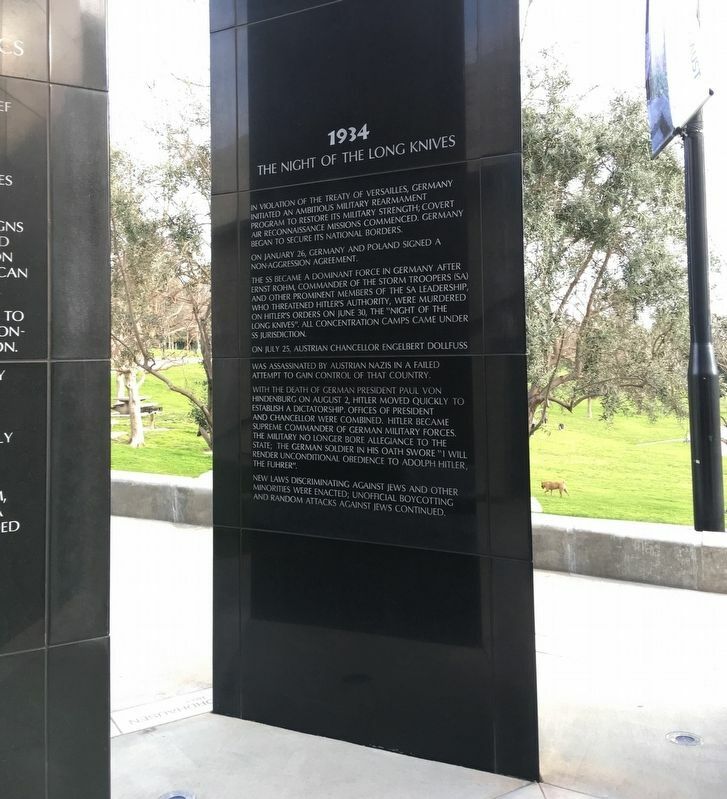 Located in Pan Pacific Park, behind the Los Angeles Museum of The Holocaust. Parking lot is on Beverly Blvd, east of the post office. Marker is at or near this postal address: 100 The Grove Drive, Los Angeles CA 90036, United States of America. Touch for directions. Other nearby markers. At least 8 other markers are within 2 miles of this marker, measured as the crow flies. Rancho La Brea Adobe (approx. 0.2 miles away); The History of Gilmore Oil Company 1900-1945 (approx. 0.3 miles away); Chester Stock, Ph.D. - Observation Pit (approx. 0.8 miles away); Hancock Park (approx. 0.8 miles away); Berlin Wall Segments (approx. 0.9 miles away); Carthay Circle (approx. one mile away); Jedediah Strong Smith (approx. one mile away); Daniel O. McCarthy (approx. 1.1 miles away). Touch for a list and map of all markers in Los Angeles. More about this marker. 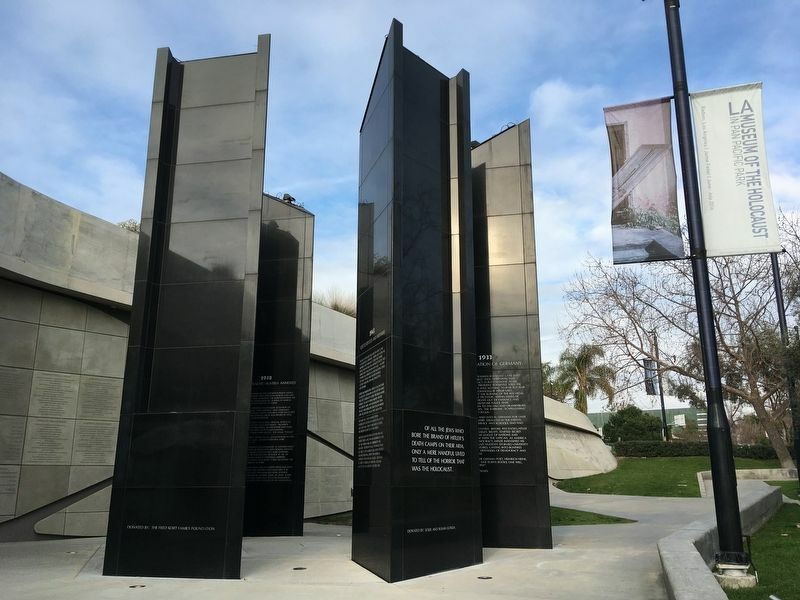 This marker is part of the Holocaust Monument, six 18-foot tall triangular black granite columns with inscriptions covering the Holocaust period, 1933-1945. Construction cost $3 million. Located in Pan Pacific Park, it can be visited any time. The museum is open daily 10-5, Fridays 10-2, with free admission. More. Search the internet for 1934: The Night of the Long Knives. Credits. This page was last revised on March 11, 2019. This page originally submitted on March 7, 2019, by Craig Baker of Sylmar, California. This page has been viewed 52 times since then. Photos: 1. submitted on March 7, 2019, by Craig Baker of Sylmar, California. 2, 3. submitted on March 8, 2019, by Craig Baker of Sylmar, California. • Andrew Ruppenstein was the editor who published this page.